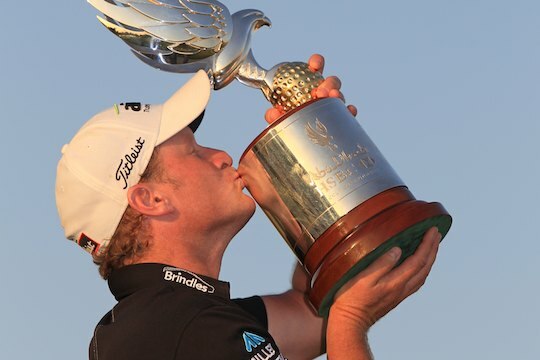 Welshman Jamie Donaldson finished with an excellent final round 68 on Sunday to nudge out Justin Rose and Denmark’s Thorbjam Olesen to win the HSBC Abu Dhabi Championship. Donaldson finished at 14-under-par, one ahead of Rose who closed with a 71 after Olesen finished with a 68. It was a tournament which contained the world Nos.1 and 2, Rory McIlroy and Tiger Woods, and down the stretch Donaldson fended off the world No. 4 Justin Rose with a display of tradesmen like golf of hitting fairways and greens. Rose had gone into the final round with a two-stroke lead and made the ideal start with a birdie at the second. But a brilliant display of putting from Donaldson meant the heat was being applied all afternoon and it showed with the worst shot Rose played all week at the 16th that led to a costly bogey. Donaldson gave Rose a chance with a bogey of his own at the 18th, leaving Rose standing over a 12ft birdie putt to force a sudden-death play-off. It was a dramatic final round as Rose lipped out on the last and David Howell four-putting from four feet when he seemed on the verge of victory. The victory hauled the 37-year-old Donaldson into the world’s top-30 and so identified him as the UK’s latest member of the world elite. That kind of progress brings its own rewards with entry this year into the four majors, and the big WGC World Championship events. The win also extends Donaldson’s European Tour exemption until the end to 2015. Donaldson said he is determined not to let such an unlikely golden chance pass him by at such an advanced stage of his career. Rose inside would have been deeply disappointed with his finish. After such a brilliant run of form – this was his sixth top-six placing in his last eight stroke-play events – Rose wanted nothing better than to clinch a victory in a field which included Woods and McIIroy. Andrew Dodt finished the best of the Aussies in a tie for 17th at 7-under, one better than Marcus Fraser. Woods and McIIroy both missed the cut with McIIroy carding consecutive rounds of 75 and Woods firing rounds of 72-75.